1 John 10:10 - I came that they may have life, and have it abundantly. Gal 5:22-23 - But the fruit of the Spirit is love, joy, peace, patience, kindness, goodness, faithfulness, gentleness, self-control HARD EASY My goal in life is to please God. 2 Corinthians 5:9 I please God by being like Jesus Christ. Matthew 3:17 Romans 8:28-29 God knows I will not be perfect, but He does expect me to be growing. Ephesians 4:22-24 2 Peter 3:18 Point of Decision SELF SELF GOD GOD HARD EASY Galatians 6:8 - The one who sows to please his sinful nature, from that nature will reap destruction. Matthew 11:30 – For my yoke is easy and my burden is light. 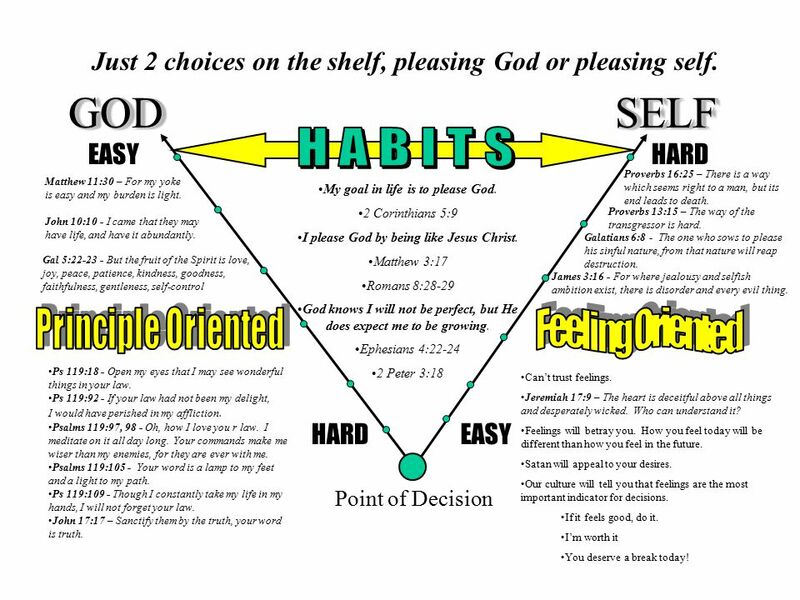 Just 2 choices on the shelf, pleasing God or pleasing self. Can’t trust feelings. Jeremiah 17:9 – The heart is deceitful above all things and desperately wicked. Who can understand it? Feelings will betray you. How you feel today will be different than how you feel in the future. Satan will appeal to your desires. Our culture will tell you that feelings are the most important indicator for decisions. If it feels good, do it. I’m worth it You deserve a break today! Ps 119:18 - Open my eyes that I may see wonderful things in your law. Ps 119:92 - If your law had not been my delight, I would have perished in my affliction. Psalms 119:97, 98 - Oh, how I love you r law. I meditate on it all day long. Your commands make me wiser than my enemies, for they are ever with me. Psalms 119:105 - Your word is a lamp to my feet and a light to my path. Ps 119:109 - Though I constantly take my life in my hands, I will not forget your law. John 17:17 – Sanctify them by the truth, your word is truth. Proverbs 13:15 – The way of the transgressor is hard. James 3:16 - For where jealousy and selfish ambition exist, there is disorder and every evil thing. Proverbs 16:25 – There is a way which seems right to a man, but its end leads to death. 2 Prov 16:18 - Pride goes before destruction, a haughty spirit before a fall. Ps 10:4 - In his pride the wicked does not seek him; in all his thoughts there is no room for God. Prov 13:10 - Pride only breeds quarrels, but wisdom is found in those who take advice. A Double heart  A Double heart – A heart that thinks one thing and says another. A heart that knows one thing to be true, yet behaves contrary to that knowledge or standard. 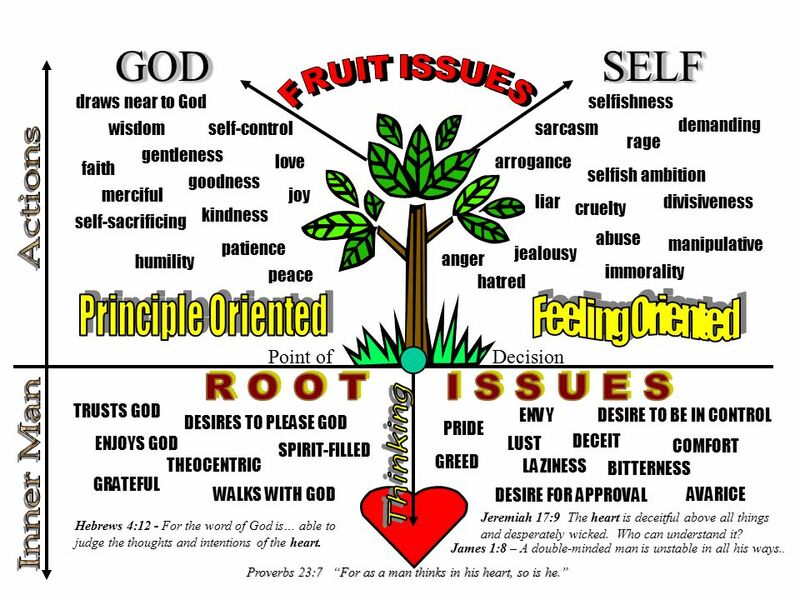 GOD GOD SELF SELF Proverbs 23:7 “For as a man thinks in his heart, so is he.” Jeremiah 17:9 The heart is deceitful above all things and desperately wicked. Who can understand it? A Heart that God Wants Us to Develop James 3:17 - The wisdom from above is first pure, then peaceable, gentle, reasonable, full of mercy and good fruits, unwavering, without hypocrisy. A Proud Heart  A Proud Heart – Pride clouds our thinking and affects our behavior. To avoid pride, you must be humble. A Clean Heart  A Clean Heart - To have a clean heart, a person must repent – God will do His part to create the clean heart, but we have to be willing to repent from the sin that brought about the unclean condition in the first place!. It includes confession. It produces ‘fruits of repentance’ (evidence of a clean heart). By using the term create, David expresses the fact that nothing short of direct divine intervention could bring about the change that he desired in his heart. Psalm 51:10 - Create in me a clean heart, O God, and renew a steadfast spirit within me. If you don’t have a clean heart, you’ll never know the next type of heart... Glad Heart  Glad Heart - The fruit of the Spirit is joy, it is evidence of the Spirit’s work in a person’s heart and life. People with a glad heart focus on three things: Who God is (Ps. 104); What God has done (Ps. 107); What God will do (Ps. 110). Psalm 16:9 - Therefore my heart is glad and my tongue rejoices; my body also will rest secure. Steadfast Heart  Steadfast Heart - A steadfast heart doesn’t quit – give up – or be easily moved when the wind of trial and pressures come its way because of what it focuses on: God’s lovingkindness (Ps. 107:43); God’s truth (Ps. 108:4); God deliverance and power (Ps. 108:13). Psalm 57:7 My heart is steadfast, O God, my heart is steadfast; I will sing, yes, I will sing praises! Ps 108:1 - My heart is steadfast, O God; I will sing and make music with all my soul. Point of Decision A Heart that God Wants Us to Avoid  An Embittered heart  An Embittered heart – Bitterness is a foothold for resentment and the origin of anger. A heart of bitterness not only affects the person who is bitter, it also affects the people around that person in a very destructive way. James 1:8 A double-minded man is unstable in all his ways. James 4:8 Cleanse your hands, you sinners; and purify your hearts, you double-minded. Psalms 73:21-22 - When my heart was grieved and my spirit embittered, I was senseless and ignorant; I was a brute beast before you. Acts 8:23 - For I see that you are full of bitterness and captive to sin. Hebrews 12:15 - See to it that no one comes short of the grace of God; that no root of bitterness springing up causes trouble, and by it many be defiled. Hebrews 4:12 For the word of God is living and active and sharper than any two-edged sword, and piercing as far as the division of soul and spirit, of both joints and marrow, and able to judge the thoughts and intentions of the heart. 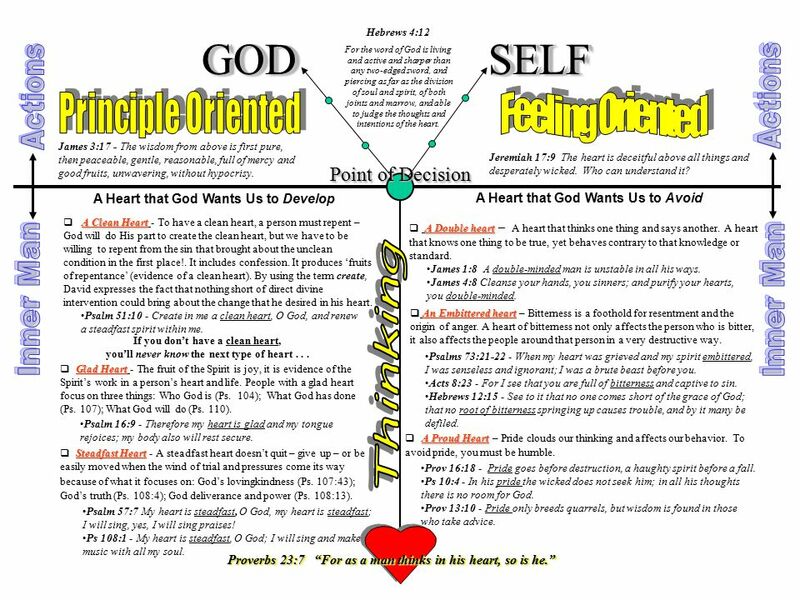 3 Point of Decision GOD GOD SELF SELF Hebrews 4:12 - For the word of God is… able to judge the thoughts and intentions of the heart. Jeremiah 17:9 The heart is deceitful above all things and desperately wicked. Who can understand it? PRIDE GREED LUST humility love anger selfishness SPIRIT-FILLED joy peace patience kindness goodness gentleness self-control arrogance sarcasm immorality cruelty jealousy DECEIT DESIRES TO PLEASE GOD self-sacrificing merciful abuse faith DESIRE FOR APPROVAL COMFORT liar DESIRE TO BE IN CONTROL LAZINESS Proverbs 23:7 “For as a man thinks in his heart, so is he.” hatred ENVY rage selfish ambition draws near to God wisdom ENJOYS GOD WALKS WITH GODAVARICE TRUSTS GOD BITTERNESS GRATEFUL THEOCENTRIC demanding divisiveness manipulative James 1:8 – A double-minded man is unstable in all his ways..
5 Walk in the Spirit Repent and Replace Recognize your heart problem. Repent of the idol that has ruled your heart. Replace attitudes with a desire to please God. Contemporary views of the heart equate it with feelings or emotions. The biblical view is that your heart is your inner life seen only by yourself and God. It is unknown to others because it is hidden from them. 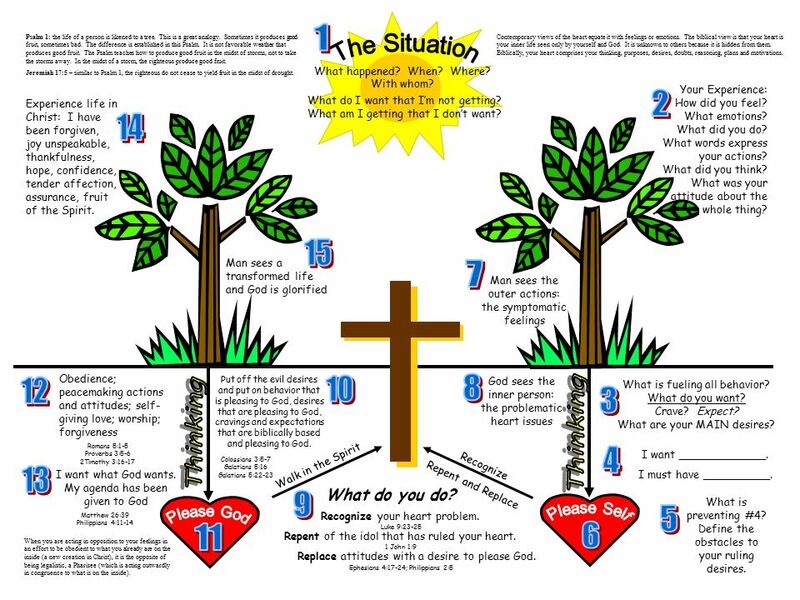 Biblically, your heart comprises your thinking, purposes, desires, doubts, reasoning, plans and motivations. What is fueling all behavior? What do you want? Crave? Expect? What are your MAIN desires? Your Experience: How did you feel? What emotions? What did you do? What words express your actions? What did you think? What was your attitude about the whole thing? Psalm 1: the life of a person is likened to a tree. This is a great analogy. Sometimes it produces good fruit, sometimes bad. The difference is established in this Psalm. It is not favorable weather that produces good fruit. The Psalm teaches how to produce good fruit in the midst of storms, not to take the storms away. In the midst of a storm, the righteous produce good fruit. Jeremiah 17:5 – similar to Psalm 1, the righteous do not cease to yield fruit in the midst of drought. I want _____________. I must have __________. What is preventing #4? Define the obstacles to your ruling desires. Man sees the outer actions: the symptomatic feelings God sees the inner person: the problematic heart issues When you are acting in opposition to your feelings in an effort to be obedient to what you already are on the inside (a new creation in Christ), it is the opposite of being legalistic, a Pharisee (which is acting outwardly in congruence to what is on the inside). Recognize Put off the evil desires and put on behavior that is pleasing to God, desires that are pleasing to God, cravings and expectations that are biblically based and pleasing to God. Obedience; peacemaking actions and attitudes; self- giving love; worship; forgiveness Colossians 3:5-7 Galatians 5:16 Galatians 5:22-23 1 John 1:9 Ephesians 4:17-24; Philippians 2:5 Luke 9:23-25 Experience life in Christ: I have been forgiven, joy unspeakable, thankfulness, hope, confidence, tender affection, assurance, fruit of the Spirit. I want what God wants. My agenda has been given to God What do I want that I’m not getting? What am I getting that I don’t want? What happened? When? Where? With whom? Man sees a transformed life and God is glorified Romans 5:1-5 Proverbs 3:5-6 2Timothy 3:16-17 Matthew 26:39 Philippians 4:11-14 What do you do? Download ppt "John 10:10 - I came that they may have life, and have it abundantly. Gal 5:22-23 - But the fruit of the Spirit is love, joy, peace, patience, kindness,"
The Good Shepherd Provides - Busyness Quiz 1. Are you usually in a hurry? My Grown Up Christmas List. Do you remember me…I sat upon your knee I wrote to you with childhood fantasies Well, I'm all grown up now and still need. Behold The Beauty of the Lord (Psalm 27:4) From an outline by Ron Halbrook. Solid Steps of Christian Growth A Study of 2 Peter 1:1-11. Its All About the Heart! YHWHs Cycle of Life Yeshua Our First Love. Reviving A Love For The Truth Text: Revelation To Be Against … To Be Down On To Be Down On Why? They Were Full Of Form … What Form? We Are Christians. Three Parts of Man Body Soul and Spirit May your spirit, soul, and body be kept blameless. 1 Thes.5:23. The Spiritual Man. 1 Cor 2:14-15 Now the natural man receiveth not the things of the Spirit of God: for they are foolishness unto him; and he cannot know. James 1: But each one is tempted when he is drawn away by his own desires and enticed. Then, when desire has conceived, it gives birth to sin; and. The Way of Man Jeremiah 10: Jeremiah 10:23 O LORD, I know the way of man is not in himself; it is not in man who walks to direct his own steps. Seeking the Things of God 8 The Elephant in the Room.